He Jiankui, of the Southern University of Science and Technology, in Shenzhen—which was not involved in the work—says he edited a gene, ccr5, that allows hiv to infect human cells. Mr He claims to have created one baby resistant to hiv infection, and a twin who is not. (Another woman is apparently carrying an edited embryo.) If reproductive cells were affected, any such modifications will be passed on to subsequent generations. There is still uncertainty over what Mr He has done. But it is just a matter of time before someone, somewhere, edits human embryos that are grown into babies. Governments and regulators need to pay heed. Presume that Mr He’s assertions are truthful. One day it may make sense to edit an embryo—to cure genetic diseases, say. That day has not arrived. The technology is so new that the risks to human subjects cannot possibly justify the benefits. Scientists do not fully understand the scope of the unintended damage crispr does to dna elsewhere in the genome or how deactivating ccr5 might leave you vulnerable to other diseases (it may, for instance, make death from flu more likely). Mr He’s work appears to have had the scantiest oversight and a vice-minister says it violates regulations. Mr He told delegates at a gene-editing conference in Hong Kong this week that he had run the idea for the trial past four people. It seems likely that Mr He himself was largely responsible for deciding whether his human experiment was worth the risks. It is not clear that the babies’ parents gave their informed consent. Nor did the procedure fulfil any unmet medical need. For the child whose genome was edited to confer resistance, the claimed benefit is protection from a virus that she may never encounter (although her father is hiv-positive, his sperm were washed to prevent infection during fertilisation) and for which there is a good, and improving, standard of care. If the reports are correct, the second child has been exposed to the potential risks of an edited genome but can still be infected by hiv. The idea that one scientist could make the leap towards editing reproductive cells has been condemned, but it has not been ruled out. Even if Mr He turns out to be a fraud, others have the means, the motive and the opportunity to do similar work. crispr is not a complex technology. That leads to two responses. 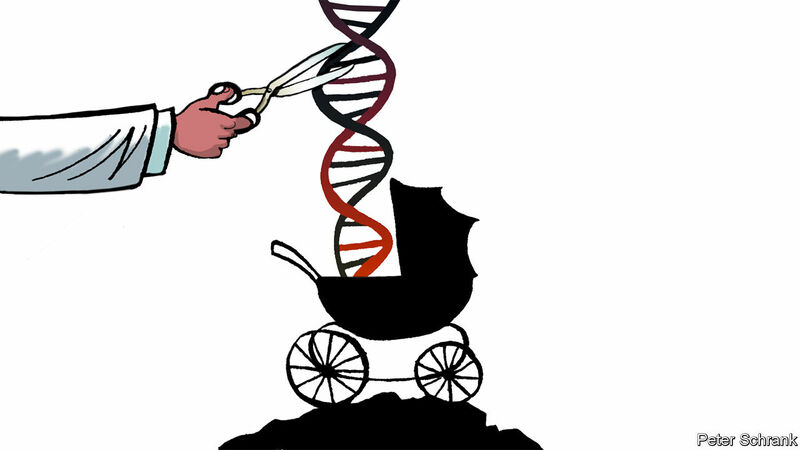 The first is practical: better oversight of places such as fertility clinics, where back-room genome-tinkerers may lurk. That applies not just in China, where Mr He has attracted vocal condemnation, but also in America, where ivf clinics could use greater regulatory scrutiny. The second is proper debate about when gene-editing is warranted. Editing the unhealthy cells of those suffering from genetic diseases such as Duchenne’s muscular dystrophy and cystic fibrosis will alleviate their suffering. It is less clear when it is necessary to edit embryos, but Mr He’s experiment obviously fails the test. Fertility treatments already screen embryos for unwanted genes. It may even be that editing will one day be used on embryos to enhance genomes (to make people cleverer, say), rather than to cure disease. But that requires regulators, policymakers, scientists and civil society to think through deep ethical questions. Work is already under way to develop principles for editing reproductive cells. Earlier this year the Nuffield Council on Bioethics, a think-tank in Britain, outlined two: that the changes brought about by gene-editing should not increase “disadvantage, discrimination or division in society” and that such changes should not harm the welfare of the future person. Such debate was always going to be needed. Now it is urgent.